New Delhi, Mar 05, 2018 : More than 28 lakh candidates will appear for class 10 and 12 examinations conducted by the Central Board of Secondary Education (CBSE) from Monday, a board official said on Sunday. A total of 16,38,428 candidates have registered for class X examination, while 11,86,306 candidates have registered for class XII examination. The class X board examination has been reintroduced from this year after the government decided to do away with the Comprehensive and Continuous Evaluation (CCE) adopted earlier. 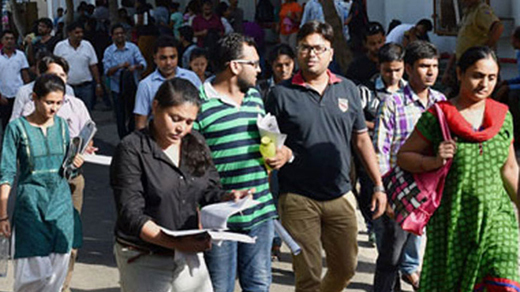 The exam will be conducted at 4,453 centres across India and 78 centres outside India. Similarly, for class XII, the exam will be held at 4,138 centres in India and 71 centres abroad. Candidates suffering from diabetes are allowed to carry eatables inside the examination centres. From this year, CBSE is also allowing candidates with special needs to write their exams using laptops but their device will have to undergo an inspection by the computer teacher at the exam centre and no Internet access will be allowed. A total of 4,510 and 2,846 differently-abled candidates have registered for class X and XII examinations respectively.